Tuesday 2nd April 2019: Shannon Airport passenger’s options have widened again this week with the launch of two new twice-weekly flights, bolstering both sun options and services into its biggest market, the UK. 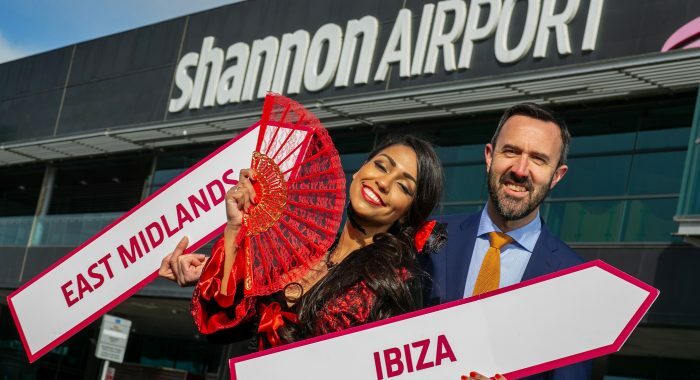 In what is a major boost for sun-worshipers, Shannon passengers can from this week enjoy direct flights to Ibiza – a sun kissed Balearic Island that offers volumes more than its wider reputation as a party-island. Ryanair will operate the service every Wednesday and Sunday, departing mid-afternoon, from now to end of October, increasing sun holiday capacity at Shannon by another 21,000 seats. The timing and days of week allow for great flexibility for a short or long stay option. Ryanair has also launched a twice-weekly service to East Midlands and will operate the service until the end of October 2019. The flights will depart at 8.20am on Mondays and 9.10pm on Fridays, strengthening its regional connectivity by another 22,000 seats. The timing and days of week allow for great flexibility for a weekend break or for a week long business trip. Andrew Murphy, Shannon Airport Managing Director, said it is an exciting time for the airport. “2018 was our best year in over a decade at Shannon and the launch of these two new routes as part of our packed summer schedule is very exciting for us. Ibiza is known as a party-island but is so much more than that, with quieter parts of the island offering some stunning locations for a sedate and luxurious holiday.